Continuing our trend from this week's Weekly Legends, we're going back in time. Today, that means back to the early days of Tempo Rogue. I'm not sure if you remember (you probably do) but when Tempo Rogue first got popular after the Un'goro rotation, Elemental Tempo was one of the first iterations of the build. In fact, we may have even covered it on this series. It has been a long while since then (nearly a year) but with so many shifts happening as of late, it appears the build has gotten some power once again. Tempo Rogue took a huge hit with the recent nerfs, but as we've learned just because something is down, does not mean it's out. Rase took this week's deck to legend, and, like so many good decks, he did it by blending two different styles and throwing in a few completely new cards to the mix. Glacial Shard Elementals are the name and tempo is their game. No card encapsulates both of those things like Glacial Shard . 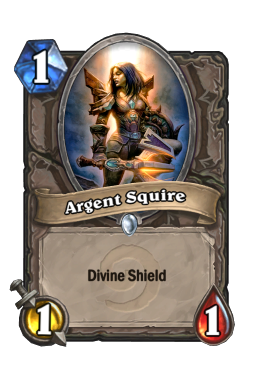 This unassuming 2/1 is not scary at first glance, but as someone who took it to legend in Quest Rogue, I can tell you this thing packs a crazy strong punch. Your goal with this deck is to play your cards in a way that constantly push your opponent against the wall. Tempo is perhaps the most powerful aspect of Hearthstone, and there are several ways to achieve it. This card contains all of them. You get a body (always relevant) an elemental tag to set up future turns, and a freeze effect to lock down your opponent's damage and protect your own board. Not to mention, the one drop is a great way to activate combo. This card is not just another minion, it is one of your best swing plays. Don't burn it early. It can be tempting to play right away, but this is largely a midrange card. Another great thing about the small elemental is how well it works during races against other fast decks. Yes, the tag is important for setting up some of your stronger threats, but freezing something is incredibly important as well. I know you're sick of this, but surprise rears its head here once again. Almost nobody plays Tempo Rogue right now, and even those that do don't run Glacial Shard . As such, your opponent will never calculate one of their minions getting frozen when thinking about lethal. If you find yourself in a tight situation, holding back on the one drop can be a great way to get an edge that your opponent will never properly calculate for. Remember, you can also freeze face if you're scared of your opponent topdecking or using a weapon. Combo Work your combo. There are quite a few combo cards in this deck (SI:7 Agent , Edwin Vancleef , Elven Minstrel etc.) and you want to play to them all. Combo is something we've covered a few times, and that's because of how easy it is to miss or not think about. You play some minions on curve, stick a few threats, and then suddenly you have a few dead cards in your hand. You never want to wait on your minions, and not properly planning for a good combo curve can really hurt when trying to push into a Vilespine Slayer or the like. Combo is a waiting game a lot of the time, and that takes a good amount of planning. When thinking about your early turns, look at the combo cards you have in your hand. 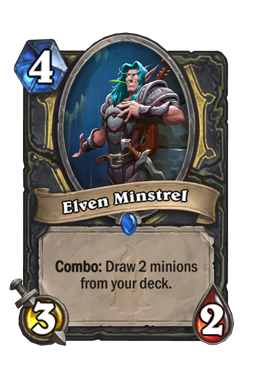 Then, see how important those combos are and play your smaller cards only if you don't need to trigger the combo. For example, it can often be worth taking two or so extra damage to use Backstab with SI:7 Agent , and it can also be worth not freezing an early threat to help hit a Elven Minstrel on five. For those reasons, the coin is also extremely useful in this deck. You should only ever play it without combo if you absolutely need minions on the board to meet a particularly strong opening. Saronite Chain Gang You are largely an aggressive list, which means you want to apply pressure to your opponent in as many ways as possible in order to force them down bad routes. However, it always helps to get a little bit of extra defense when you need it. 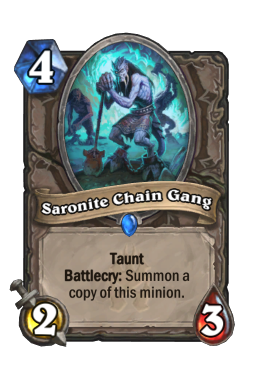 There are a few ways you can protect yourself here, but none of them are quite as powerful as Saronite Chain Gang . The four drops are a great way to buy extra time and they really put the hurt on decks like Aggro Paladin who rely on swarms of small things to push. These cards are strong on curve, but most of the time you're going to set them up in a way where your opponent cannot easily deal with them. Even if they do only live a turn, being able to stave off damage while you rebuild or draw into answers is very strong. You want to play them turn four if they're your only play, but if you have other options, saving these against faster decks can be a great way to stretch out the end game. The other reason Saronite Chain Gang is so good in these tempo builds is because of the way it protects your board. The meta is in an odd place where only Priest and Warlock have AOE. That means most decks rely on their minions to get in good trades and clean up troublesome minions. 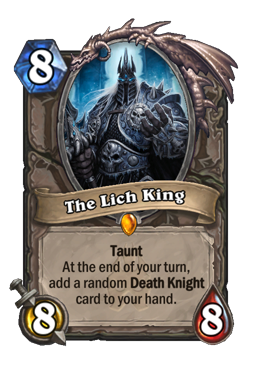 It also means that a lot of decks don't have ways to get through two taunts (no matter how small). If you have a big beater or some special minion you want to keep around, don't be afraid to run these out. Hearthstone is all about planning, and your opponent is going to do everything they can to calculate the next turn trades. If you can suddenly plop down a pair of taunts that shuts out their attacks, it will ruin their plans completely. Though these work better when protecting your face, never underestimate how much they can do for your minions as well. 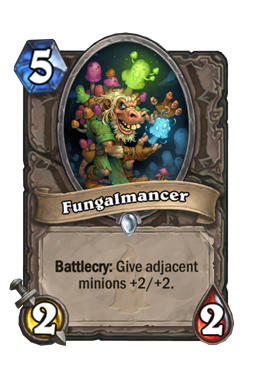 Fungalmancer A card that is becoming more and more popular in a wide range of builds, Fungalmancer packs quite a bit of punch for a long forgotten common. This minion may seem unassuming, but is much more powerful than it first seems. Yes, this card is not a lot of stats, but it is quite a bit of instant stats. 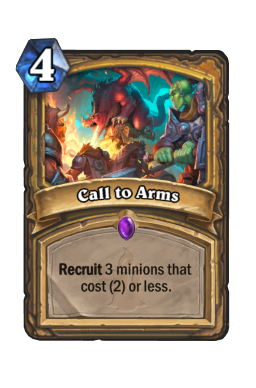 Charge has always been the most powerful (and most nerfed) ability in the game, and this is a 2/2 that basically comes with a 4/4 with change. Not the flashiest thing in the world, but in a deck that relies on having the board, it's is pretty fantastic. As long as you have two minions, this card is going to do wonders for you. So much so, that the five drop can often act as a finisher in its own right. You are a deck that feeds on tempo, and giving yourself the ability to hit face or trade (depending on your need) is exactly how you want to sculpt this deck. You always want to work to get full value from Fungalmancer , but that does not mean you need to use it for good trades. Rather, you just want to make sure the ability hits. 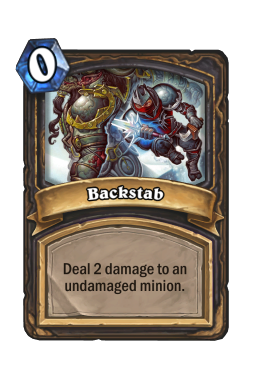 A double 2/2 buff is insane in certain situations, and when used correctly this card can blow your opponent out of the water. However, even just creating a board of strong minions can really put midrange or aggro builds on ice. For instance, turning a rather unassuming board of a 2/3 and a 1/2 into a 2/2, a 4/5, and a 3/4 is too much for many decks to handle. 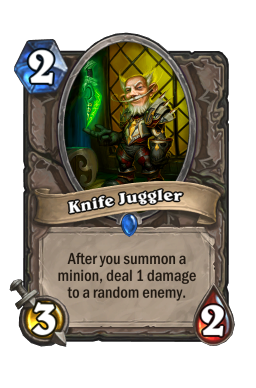 That goes double when the cards you're buffing have taunt or other abilities. Just remember to try to aim the buffs on smaller threats. It is almost always a good idea to spread your damage and stats around when possible. That way, if your opponent does have an answer, you won't get caught putting all your eggs in one basket. Blazecaller We end on the big daddy of this build. 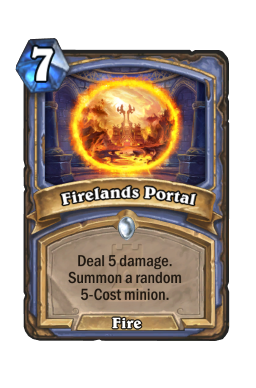 As good as The Lich King is, nothing hits quite like this Firelands Portal . 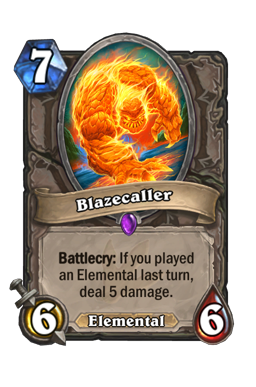 As with Glacial Shard , the reason Blazecaller is so powerful is because it is all different types of tempo rolled into a single card. You get damage, you get removal, and you get quite an impressive body. 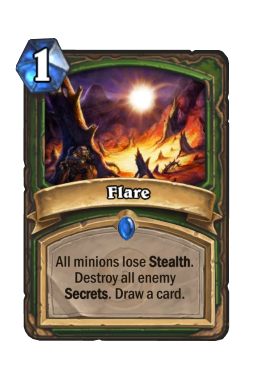 This card, like so many here, is all about finding ways to pace the board and keep your opponent's minions at bay. This is a great way to press your advantage, and is one of the strongest cards to hit with Shadowcaster . Not every deck is going to have a ton of good targets, but hitting a 2/2 or a 3/3 is relevant when you're also dropping a big body. You want to have a primary target in mind when moving up your curve. However, if you get a better target or need to play to your curve, do that instead. Blazecaller is a card that you're going to have a small window to use, which means you better be ready when you want to run it out. 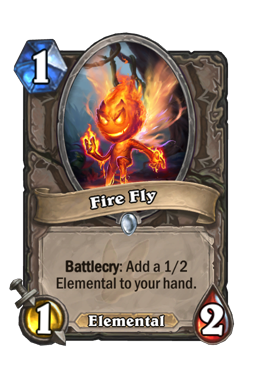 This card is only going to trigger off that sweet elemental tag, and there are only a finite amount of elementals in this build. 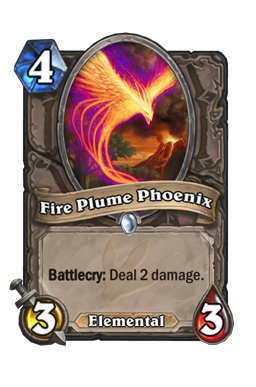 It is very easy to miss out on hitting this one because you simply used an elemental and then forgot the next turn, or you ran out of elementals to play. Letting that happen is a distaste. 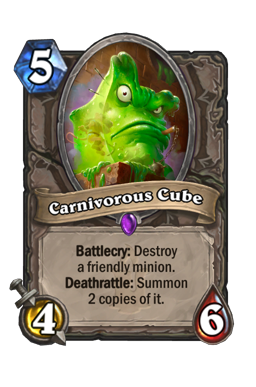 So much so that it is better to get five damage to your opponent's face than it is to have a seven mana 6/6 with no ability. On that note, this card is also a great way to get in extra damage or pressure when you need it. You have a lot of cards press the board, but very little that bring burst. Do not be afraid to play to this card as a finisher, and do not be afraid to use this to set up potential lethal. The four decks I see the most while playing the ladder. Control Warlock Though its spot is definitely being challenged, Warlock is still on top. Classic control is becoming more and more popular as of late, but it's safe to say that Cubelock is still top dog. This game is all about pacing in your own way. You don't always need a good curve, but here you want to lean on your minions as much as possible. You have a lot of powerful threats, and you need to use them to make sure your opponent never gets a real hold of the board (or the game). This is a matchup where you want to run out as many bodies as you possibly can, regardless of their triggers or what they do. You simply can never have a dead turn when fighting against Warlock. Even one turn where you don't put pressure on the board can lead to a loss. Go big early and try to run them down before they get their combos online. The other half of this game is finding ways to put on finishing damage. You can get out early and press the board, but Warlock is very good at staying alive. 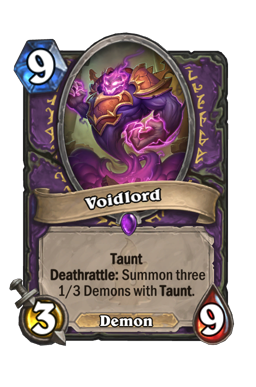 This is especially tricky once they start powering out Voidlord s on turn five. To make sure that doesn't happen, you have to figure out how to hit them when you can. Typically, it is right to hold back big finishers or burst plays. Here, as it is hard to get through taunts, your goal is to just use them when you have a window to do so. 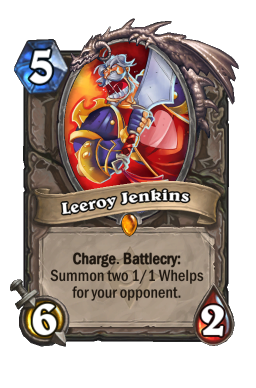 It may not feel right to slam Leeroy Jenkins on turn six, but if that's the only you can get him in, that's the play you need to go with. Should you not have any burst, try to save Vilespine Slayer for any big threats that might get in your way. 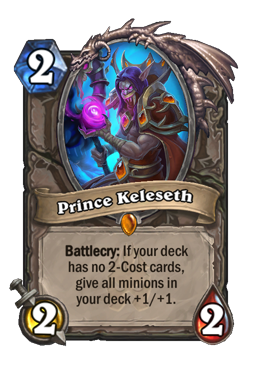 Combo Priest While I'm not saying we called this one (though we kinda did) Priest is everywhere right now. In fact, it makes up a vast majority of my matchups. The only reason it isn't number one on this list is because Warlock still has the largest presence at all parts of the ladder. When going up against Priest your goal is to make sure you never die to the combo. 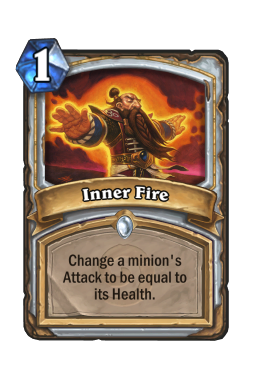 Inner Fire and Divine Spirit are still very strong, and if you ever let something with a lot of health stick around for a turn or two you are often going to die in a blaze of spells. To limit that from happening, you want to completely control this game. 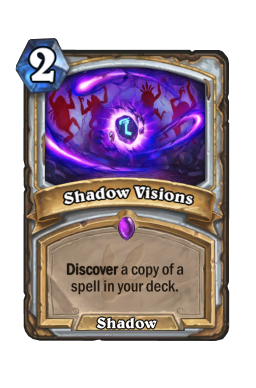 You have stronger opening minions than Priest, and you need to heavily lean on those so that by the time they start to get things going you will have plenty of answers to work with. 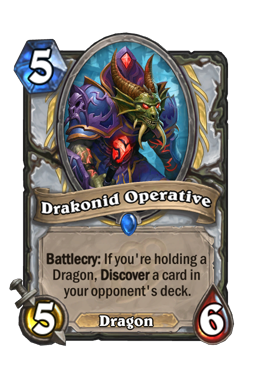 The two cards you need to constantly think about are Duskbreaker and Drakonid Operative . Breaker is fantastic against your early threats, while Operative can cement your opponent's board and give them something to buff. If you're constantly aware of both cards (not putting too many small threats out and making sure you have beefy minions in the midgame) you should be able to stay ahead. Combo Priest is strong, but it has a big weakness in that it cannot do much when it doesn't have minions. 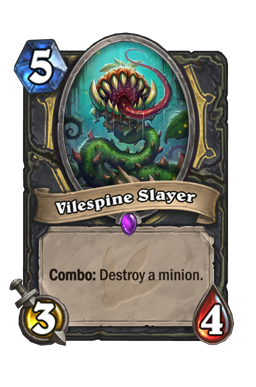 Also note that Vilespine Slayer is your best card here. 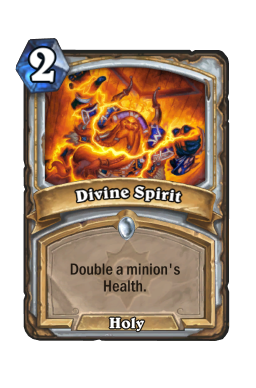 Priest will often sell their combo by buffing something up the turn before they go off. While your minions can't do much about that, slayer helps you pick such cards off. 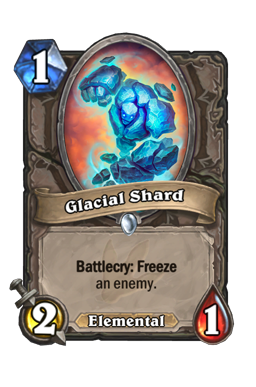 Glacial Shard is also fantastic at delaying your opponents combo while you search for answers. Aggro Paladin Aggro Paladin continues its reign of terror, which is not great news for a deck with no AOE. Your entire goal in this one is to get your minions down ahead of Paladin's curve. Not only will that give you ways to pace the game, but it also ensures that you will have the bodies you need to trade into Call to Arms . You want to desperately lean on your swing cards, and anything that removes a threat. 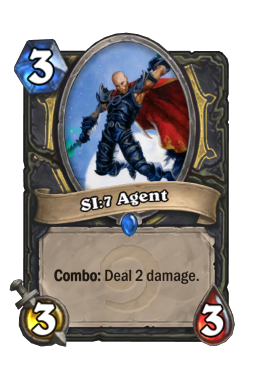 SI:7 Agent is one of the strongest cards you can play, and things like Fungalmancer are great at gumming up the board. Everything here should be about clearing. Paladin starts fast, but you can run them out of steam in a hurry. As long as you make it into turn five with a strong board, you can take this game down. If you fell behind, it's over. Be patient in this one. You want early minions, and you should always get out your bodies when they come. However, you also need to make sure you trigger your combo on powerful swing plays like SI:7 Agent or Vilespine Slayer . Backstab on turn one is often a trap because it greatly limits your potential on turns three and four. For that reason, having the coin is extremely important. Never underestimate the free mana and always be careful with your one drops. One more thing to note is how strong your hero power is against Paladin. Daggering up on turn two is a great way to play this because it allows you to chip down a ton of small threats throughout the course of the game. Even hitting a Knife Juggler twice can be solid if you have no other answer to the 2/2. Hunter Still holding down the four spot, Hunter has some punch left. The class has moved much toward the spell versions that go out of their way to lean on secrets, which is good for you. You have a lot of cards that push your opponent back, and that will make it so that Hunter cannot ever manage to get ahead in the way that they want. When playing Paladin you need to watch for turn four. Here, it is turn five. Hunter has a few short term combos built on long-term goals. 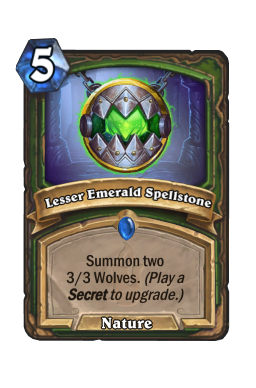 Their biggest go-big swing play is a fully upgraded Lesser Emerald Spellstone . As you have no AOE, you need to be ready for the wolves when they come. Either you need to be able to trade across the board, or you need to be able to push so much damage that when you pass the turn your opponent won't be able to leverage their 3/3's. 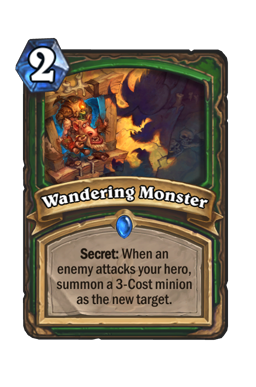 If you can successfully navigate around early secrets (always watch out for Wandering Monster ) you want to start pushing hard around turn four. That way, by the time Rexxar gets to the top of his curve, he won't have enough health to work with. 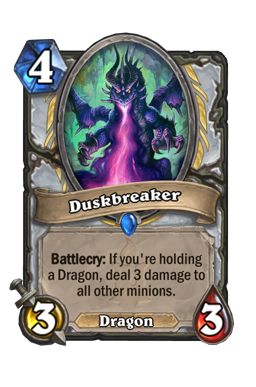 As with any Keleseth deck, you mulligan is sticking to your curve as best you can. 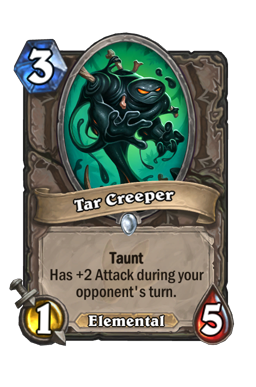 Backstab , Fire Fly and Prince Keleseth are your three must keeps, while Tar Creeper and SI:7 Agent are always good with a curve or the coin. 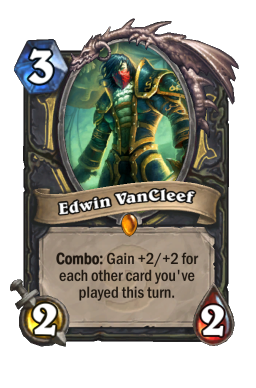 Edwin Vancleef is great with the coin, and you want to keep Elven Minstrel , Fire Plume Phoenix and Saronite Chain Gang if you can curve into them. Finally, Glacial Shard is a strong keep when you have a good opening. It's just a little weak on its own. The elements will...backstab you? Rogue has not always gone with elementals, but desperate times call for desperate measures. This version of Tempo Rogue has always been extremely interesting to me, and this new version really amps that up. Not only do you get a bunch of new cards here, but you also get the fun of being able to bounce things back to your hand multiple times. There are a ton of mini combos, which always makes for a good time. If you miss Rogue, this is a great one to try out. Until next time, may you always play a 12/12 Vancleef on turn three.